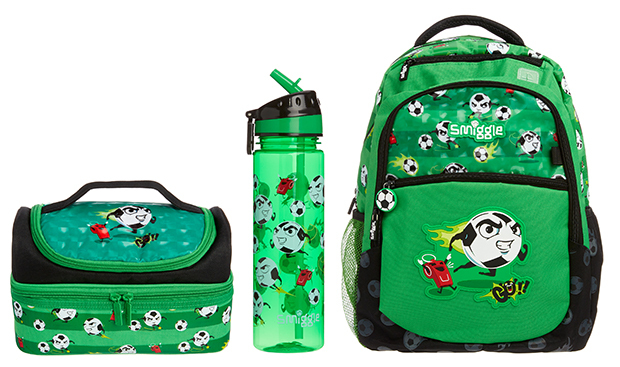 Last minute Back To School ideas from Smiggle! Well we’ve survived the ‘back to school’ frenzy, but if you’re anything like me you haven’t got everything yet, even though you were still buying things the day before school went back! There’s still a few things I need to get, including replacing our old manky drink bottles. I’m sure we will have some other things pop up during that first week back… once the kids are back in routine and realise they need something (there’s always something!). Smiggle is like a one-stop back to school shop, and to make things even easier I have put together a quick guide which includes a few things you may still need to get (or replace) for the new school year. 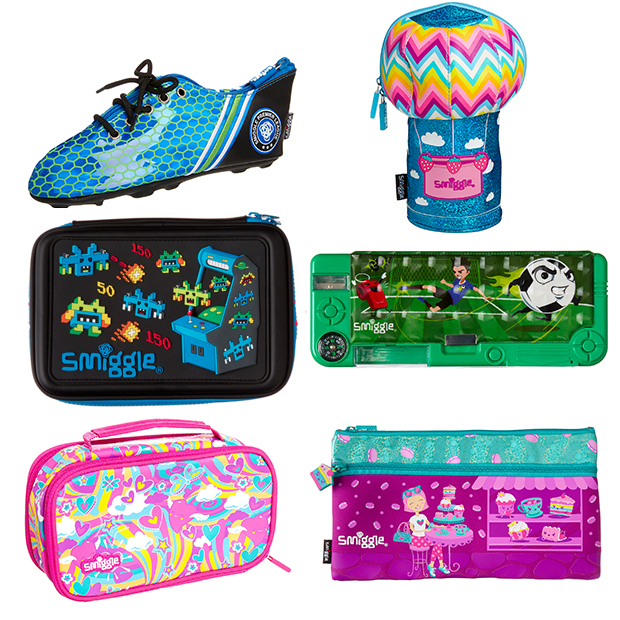 Smiggle has bags for all ages, below are some of my favourites. The Light Up Trolley Backpack is great for school or travel. It’s a backpack that converts into a trolley with light up wheels (awesome!!). The Light Up Trolley Backpack comes in four fun colours/designs and is $84.95 and is a pictured below, top left in black. A great back for the preschooler, the Teeny Tiny Backpack is nice and small for the little kids. There’s four super cute designs all with padded adjustable shoulder straps dual drink bottle compartments. The Teeny Tiny Backpack is $29.95 and is a pictured below, top right in mid blue. The Buckle Up Backpack is great for older kids and perfect for school with padded adjustable shoulder straps and a padded laptop (or iPad) compartment. The Buckle Up backpack is $64.95 and is available in three colours (pictured below, bottom left in mid blue and bottom right in purple). Above: Clockwise from top left – Light Up Trolley Back pack in black, Teeny Tiny Backpack in mid blue, Buckle Up Backpack in Purple $64.95, Buckle Up Backpack in Mid Blue $64.95. My kids seem to go through an crazy amount of pencil cases during the year, I actually think they ‘lose’ them just to get a new one sometimes. Never fear Smiggle have a massive range of pencil cases from crazy to the practical, there is something for every taste. The Playful Pencil Case range ($19.95) includes a Soccer Boot, Hot Air Balloon, Rainbow Cake Slice and an Arcade Game. They are heaps of fun and big favourites. If you are looking for something slightly more practical then the City Hardtop Pencil Case ($29.95) may be for you. It comes in two colours/designs (black and purple) and has an awesome embossed silicone scented front cover. Another great option is the City Pop Out Fan Pencil Case ($29.95) which actually has a prop up fan!It has a built in sharpener and eraser drawer but the down side is it needs 2 x AAA batteries which are not included. For those who have heaps of pens and pencils otherwise known as stuff, the Snazzy Go Anywhere Pencil Case is great. It has four deep zip pockets, lots of elastic pen/pencil holders and comes with a carry handle. You can get it in five awesome colours/ designs. There is also a great range of soft pencil cases like the City 330 Pencil Case ($16.95). These are your everyday rectangular pencil cases which have two zippered compartments and are available in five colours/designs. Bottom Row – Snazzy Go Anywhere Pencil Case in pink $64.95. 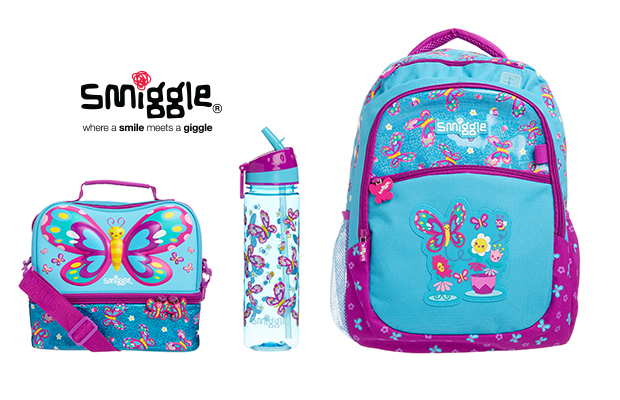 If you, or your kids like everything matchy-matchy then Smiggle is all over it! When you walk into a Smiggle shop you can easily identify groups of colours and designs which makes it super easy to match everything up. You can see what I mean below where I have created a boys and girls set. For the soccer fans, pictured below we have the City Backpack $54.95, City Double Decker Lunch Box $26.95, and the City Straight Drink Up Bottle $16.95. 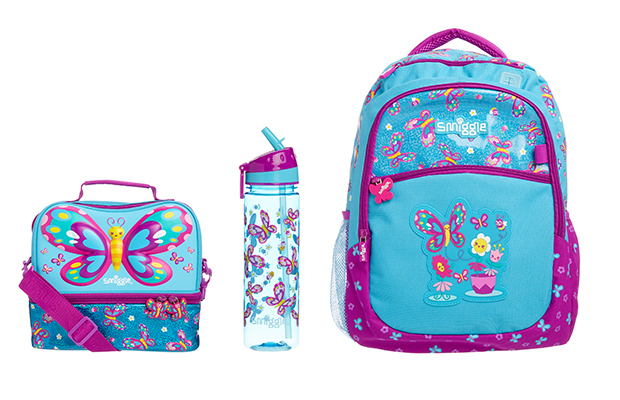 For the butterfly fans, pictured above we have the City Backpack $54.95, City Hard Top Lunch Box $32.95, and the City Straight Drink Up Bottle $16.95. Competition now closed. Winners announced soon. 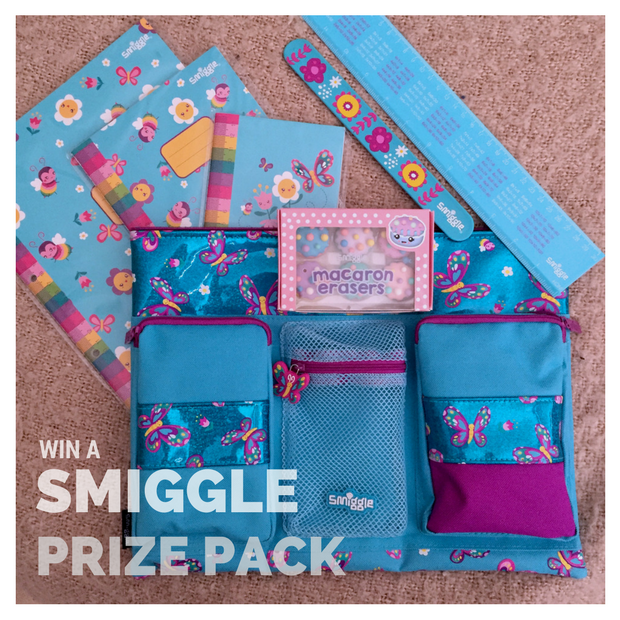 Win a Smiggle Prize Pack! This prize pack is just what you need for the new school year. Comment below and tell me your favourite Smiggle product and why you (or the kids) love it? Competition ends 20 February 2017. Full T&C’s can be found here. My daughter loves the pencil case you have up for grabs the City A4 Pencil Case. She went looking 2 weeks ago but they have sold old. She just had a fit when she saw your prize pack, thats the one, thats the one! A school friens has one of course! We love the hard top lunchboxes – bright funky designs that keep our girls lunch nice and fresh all day! the water bottle is very loved in this household as it is leak proof and very pretty! We love the eraser filled candy grabber, so much fun and great for practise to use the big ones at the shops! I even think they’re a hit! And the range is a delight! My soccer-mad son LOVES the football boot pencil case. Now I know he is looking after his stationary at last! No more lost pens. My daughter favourite all the lunch boxes and water bottles, she loves the new spray on the water bottle to cool her off!!! Smiggle Green headphones are MUSIC to my EARS! The acoustics SPEAKERS for themselves and leave no TONE unturned. WATT amazing sound! funk metallic double hardtop pencil case is our family favourite – lots of space to carry all the essential stationary items for school plus it doubles up as a first aid kit for unfortunate emergencies. The big girlie pencil case is awesome, it would mean that my daughter would have to carry only one pencil case not two. enough to bring a smile to any child’s face! and plenty, plenty of space! My young miss has sensory problems, she loves the SMIGGLE scented gel pens. Her Aunty gave them to her and little Miss loves using them. Yet practical with separate snacks in mind. My daughter and I LOVE the Smiggle Kitty interactive money box! It is awesome and makes it fun for my daughter to save! Triple up Hardtop Pencil Case for my daughter’s school stationery all in one place. Being organised will ensure a great school year ahead; Smiggle gets top marks on getting my kids excited about stationery! SMIGGLE’s HARDTOP trolley bag in black – so suitable for sleepovers, school camps and trundling items to school on the days when the load is too heavy for a boy’s backpack. Love the soccer boot pencil case too! Smiggle pencil case is ace! Put it in my Buckle Up Backpack as I go for stuff to crack! I love the City Double Decker Lunch Box. The perfect size and look. Not me, but my kids – they love the Fart noise maker. I don’t think I’ll ever know why beyond the fact that they are 5 and 7 years old. Head over heals for their cute little pouches. I have my camera in one and I got my daughter a cute animal one for her first camera. I love the Smiggle backpacks for school! They are great quality, last forever and are the perfect size for school with lots of zippered compartments and a spot for a drink bottle. 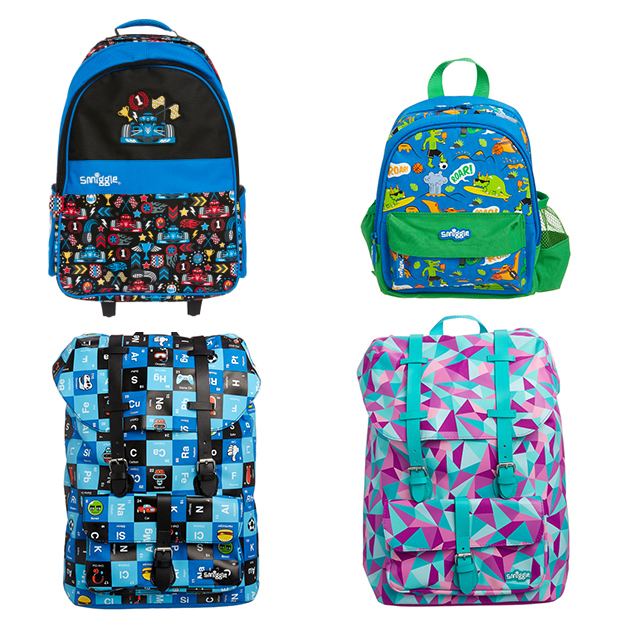 The kids love the bright and fun designs, their Smiggle backpacks always stand out in the crowd! Smiggle Scented Pencils work deliciously well! The drink bottles. They are bright and fun and easy for my son’s to use. smiggles smuggles what to choose it won’t matter you cannot lose everything’s trendy everything’s bright everything is just right!!! My kids have my taste, simple yet exciting. We all love the fluffy pens to tickle our faces with when we’re bored or brainstorming! And always are sure to bring her delight. We love our 3 compartment pencil case that came with pencils, textas and all the other needed things. Smiggle is amazing ! Any of the pencil cases, we love the designs and how spacious they are, storing quite a bit! My favourite Smiggle product is the ‘maze pens’. Why I love them is because whenever I look at a normal pen I always think what’s so fun about this. When I am writing with one of the maze pens I always think to myself of how fun it is because let’s say for instance that you are stuck on a question in class, while you are stuck on that question you can try and solve the maze. My daughter loves everything to do with smiggle and her favourite thing changes all the time but at the moment she is loving her smiggle headphones and smiggle purse which she doesn’t leave home without ! The battery operated pencil sharpener is the best in our book: convenient for child and no mess for parent. It’s a win-win! We spend ages in our smiggle shop every time we are at the mall. So many cool things and treasures for kids- they’d love to own them all!! My daughter’s favourite is a pencil case bursting with pens and pencils inside to create with! Hard decision as there is so much to choose from. The pencil cases certainly make school fun, backpacks are bright and roomy and the kids love their lunch boxes . The smelly/ scented gel pens because the kids say it ‘smells good’ but I love the hard case box they come in to keep them altogether in a compact unit, unlike other companies that sell theirs in a L-O-N-G plastic packet that’s difficult for children to carry around! Great work smiggle! You kinda imagine Smiggle is where Mr Squiggle would of shopped… anyway, we like the paintbrush markers. The Smiggle backpacks. My kids love choosing from the new designs each school year. They are so trendy, the quality is amazing and there is always a design to suit their individual style. The A4 pencil case is the only pencil case big enough to hold all the essentials for school without having to sacrifice which ones have to be left at home because they don’t fit in. The snap bands, I loved them in the 90’s, I love them now (and so do my daughters!). We love the keyrings, they add such a cute personal touch to their schoolbags. Love the fluffy, smelly ones! The fluffy bunch a5 lockable notebook is always a hit, its cuddly ,comforting and they love writing in it. The Smiggle Lunchbox is amazing. My daughter loves it and she remains “cool” in class while I find it easy to clean. The top compartment is great for snacks and the main box is insulated fantastically keeping food cool. It’s rare we are both happy with a product but this is gorgeous to look at and is the best and most practical lunch box we’ve come across yet! Thanks smiggle! Learning to tell the time, no longer a chore! I personally love these clocks as they are educational- and bring simple, pure delight! But it’s the scented stickers and pens on which my kids seem to spend the pocket money they save! My little ones love the desk fan! They say that it’s super COOL when they do their homework. Scented pencils. My niece loves them. All she wants for her birthday is more smiggle! Smiggles Soccer Boot Pencil Case really makes me laugh and is perfection for a soccer mad ankle biter. I love the fluffy lockable diaries – my girls spend hours smiling and giggling together as they write and draw their “secrets”. just so they can smell the paper. Spy Pens are a favourite in our household; writing secret notes to each other gives them such a kick! It’s a hoot watching them crack up. I should probably check what they’re writing …. just in case. Probably along the lines of ‘you are a poo head’ (the current phase). Le sigh. We love the city double decker lunch box ! Huge soccer fans in our house and these are so cute! My daughters love the smelly pencils because they smell good. My daughter has said the furry, fluffy rainbow notebook. She loves to doodle and draw and it’s apparently soooo cute. We love the smuggle scented pens. They smell so good, and just make me feel happy. Little Miss 5 loves the Shimmer Backpack because apparently it looks like a backpack that ‘a princess would wear’ – so shiny and pretty! The Teeny Tiny Backpack. It’s the perfect size for my son to take to daycare, there are awesome designs and patterns and it has comfortable padded straps. My favourite smiggle products are the lunch boxes. I have a young son, and the design with the two compartments is ideal for separating lunch from snacks, and when he was younger, it kept his bibs and spoons safe and dry! Being mummah means Sharing the fun, so I also carry a smiggle lunch box to work! The times table slap band. What I originally thought was a waste of pocket money had turned into a took for making learning the times tables a little easier! Fun, functional and amazingly hasn’t been lost since purchase (10 months). The scented markers and pencil case because they are popping with colour and smell amazing! My kids go crazy for Smiggle slap bands! I don’t understand the devotion but I’m hardly the target audience! Keeping her intrigued for hours and hours! So many possibilities, it’s never done!!! Great vibrant colours, funky and cool! I love the pencil case – as it keeps all the other bits in one safe place. We love the scented paint 🎨 my daughter got some for Christmas and I think it’s great for sensory development. Miss & is a huge fan of the gel pen (the more glitter the better) and her scented pencil case. Because a little girl can’t have too many pretty, glittery delicious-smelling items in her life. Has to be the City Double Decker Lunchbox – plenty of room so no more complaining that there wasn’t enough food to get them through the day! Love the Straight Up drink bottle with the butterflies. Makes drinking water so delightful. My Little One ADORES her Smiggle Puppy pencil case with pom-pom zip, it’s her absolute favourite! We also love sharing Macarons on our coffee/babychino dates, so the Macaron erasers would be a huge hit with her too! My daughter loves the jotters especially the fluffy ones, she uses them to make up stories in. Shimmer weekender bag is sparkly, fun and functional and brand new to the Smiggle range. Miss 11 loves Smiggle anything. My daughter loves her Hard Top Smiggles Pencilcase as it’s tough and can fit all of her stationery items in for school. Party Scratch Book is my girls favourite product. They spend hours sketching and scratching away being creative on the pretty rainbow and holographic pages. If you can keep a secret – I may have stolen a couple of pages for myself to have fun with! The talking alarm clock. Nobody wants to get up early but with the cool voice telling you it makes it more bearable. I love the Spritz Bottles. The water mist function is great especially in this horrible hot weather. This super cute mini structured backpack is all the rage! with adjustable shoulder straps & carry handle, and double zipped main compartment. Get the kids to carry their own stuff! I love Smiggle’s drink bottles because they’re so cute and my daughter will drink more out of a Smiggle bottle than a normal one, which is reassuring on a hot day! Pencil case. Great size, well designed and terrific colours. Smiggle is fantastic for quality and cool products! I absolutely love the Smiggle insulated lunchboxes. They last the whole school year (would probably last 3 but who can resist buying a cool new design each year?!) and they really keep the food cool. Forget the kids, I love the Soccer shoe pencil case! That thing is absolutely adorable! 🙂 Never seen anything like it! Spot stripe sketch notebook. On my downtime, I draw, and like to keep them all together in an awesome notebook that my wonderful children know to keep their grubby little mitts off!!!!! I know that sounds terrible, but they’ve got their own supplies, that no one is allowed to touch. Playful Pencil case Soccer boot, it looks awesome. Why were these not around when I was at school? Seriously going back to the shops tomorrow to buy this for the little bloke (he can have it once my thrill with it’s worn off haha). My favorite items are smiggle lunch bags/boxes. My daughters lunch bag is still being used and in as new condition after enduring 2 years at primary school. Its also still seen as being popular and the in fashion brand. This makes me be a very happy mum! I love the Smiggle backpacks! They are so sturdy and colourful and have so many zippered pockets that my kids love deciding what to put in each pocket! My daughter loves her Smiggle Cheeky Cat Money Box. It is so insanely cute it has got my daughter interested in saving money. I absolutely love the Smiggle drink bottles. They are such a good size, the easy lift spout makes them so convenient and easy to use and I love the gorgeous colours and designs they come in! I have always kept diaries.. describing experiences and emotions and I have encouraged my own children to do the same so each year they choose a new sketch notebook. They habitually record what they’ve been doing (sometimes by drawings); how they’re feeling and paste in small momentoes of their days (movie tickets etc). The wonderfully arty covers of the sketch books look great as a collection and I know they’re valued and will be kept for many years. Snazzy Go Anywhere Pencil Case – it comes in pink which is the favoured colour, and saves pencils getting lost as they are safely kept in by the zipper! Smiggle note books are the best! Writing down thoughts and ideas is a great stress relief and an excellent way to capture precious memories. My kids love the smiggle snake puzzles. For something so simple they have spent hours coming up with different designs and play with them constantly. So great for the imagination and our #1 toy purchase for 2016! My daughters love the spritz bottles at school as when they get hot it cools them down and when no one is looking they get there friends too!! I love the butterfly lunch box. No lunches are ignored with those gorgeous bright colours! My little one has a ruler that smacks into a bracelet! She carries it everywhere and its so useful. So she can safely buy her yummy stash! Proving Smiggle again is yet to be outdone! What don’t they love?? 😄 The current favourites are the pencil boxes with all the little hidden treasures inside! Smiggle back packs for sure! My youngest son had the green soccer one for Kinder last year and it’s still in great condition. He wants the black and blue one this year, and as it’s his first full-time year, and I know how well they last, I’m letting him get one and will donate our old one. Best quality backpacks any of my 3 children have ever had! Smiggle back packs for sure! My youngest son had the green soccer one for Kinder last year and it’s still in great condition. Puts a smile on my daughter’s face!